This pair of meditation speakers helps you squeeze in a moment of mindfulness, wherever you might be. The well-made duo works in harmony to generate peaceful tones aimed at calming your mind, called New Origin Waveforms, or N.O.W. The sounds will never repeat, which helps keep you focused. The speakers automatically shut off after a three-minute-long session, leaving you to go about your day feeling refreshed. Friends asked me where to buy this. Hear Now System’s Michael Joly and Alene Sibley turned to ancient history and leaned on backgrounds in audio engineering (Michael) and intuitive coaching (Alene) to create their innovative tone therapy system. A pair of sleek, palm-sized speakers play three minute sequences of peaceful sounds based on the ancient Pythagorean tuning system. This system has long been thought to encourage relaxation and wellness. Michael and Alene call their implementation of this ancient healing system New Origin Waveforms, or N.O.W. 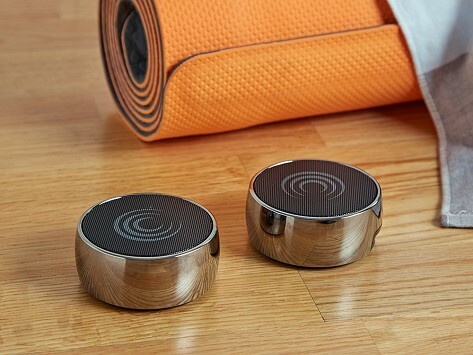 The duo's goal is to make meditating at home or the office as easy as pushing a button. So that’s all it takes to begin your three minute mini Zen moment. A session gives your mind the just-right amount of time to calm down and clear out, whether you use it for a mid-day reset or to explore meditation. The sequences play randomly on each speaker, so every session is a new arrangement of soothing sounds you haven’t heard before. The speakers shut off at three minutes, leaving you re-focused, re-energized, and ready to tackle the rest of the day.